Below are some fantastic links for your enjoyment. Please visit all of them. Please click here for Joe Cook's Tribute To The Big BAM, WBAM, Montgomery, Alabama. Devoted to the memory and preservation of recorded music. Click here to join Alabama Record Collectors. If you enjoyed WVOK Memories then check this Flashback To The Sixties slide show. It's awesome. Click here to view slideshow and enjoy. 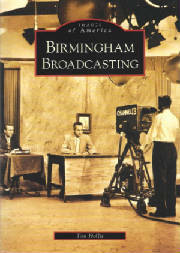 Just want to let you good folks know that Birmingham Broadcasting by Tim Hollis is NOW available at Amazon.com or your favorite bookstore. If you're bookstore doesn't have it, ask for it. It's great and includes some photos of our favorite radio station WVOK. Join Russell and Tim at BIRMINGHAM REWOUND. An Awesome site. Click here to check it out. One of the most requested artist to appear at the WVOK Shower of Stars was Lou Christie. Click here to visit Lou's website for more WVOK & WBAM information (thanks to Harry Young). For some classic radio memories join Mr. Bob Mayben by clicking here. Click here to join Bill for his Radio Time Line and sounds from the golden era of classic Radio stations. Remember The Birmingham Vulcans and The Birmingham Americans?? Both teams were part of the WFL. Join Gregg and the folks at WFL1974 by clicking here.